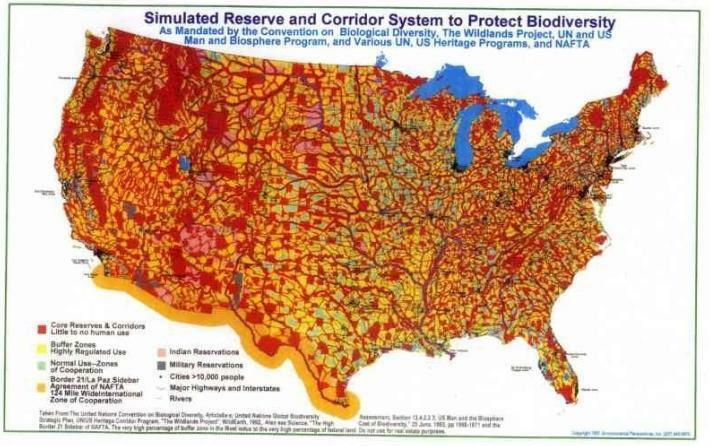 Maps that illustrate how UN Agenda 21 aka Agenda 2030 is implemented can be found in many places. The links to maps, many found WITHIN the documents below are just a sampling of what is available, IF you take the time to search for them. All kinds of maps are contained within the “development plans” for where you live. All areas have these “development plans” which are also called by different names including: comprehensive plan, growth plan, land use plan, visioning 2035, visioning 2020, metro vision 203o, etc. If you are having problems finding maps for your area contact me, and I will help you. Read this petition for now deceased Andrew Wordes who lived in Roswell, Georgia to get an idea of the type of harassment you will eventually encounter as the implementation of Agenda 21 continues via your development plan aka comprehensive plan. This is the Roswell, Georgia “development plan referred to as “comprehensive plan” which is to be accomplished by 2030. Take note of how the city lists Andrew and his neighbor’s homes on the ‘Roswell 2030 Plan’ as a green space and parks area. In other words, Andrew’s and his neighbor’s homes were to be destroyed and replaced by open space. Do you see your home on your towns comprehensive plan? Not only can your property be taken from you, but the quality of life in your neighborhood can drastically change. To see an example of this look at this video and read the article that accompanies this video here. Google the terms “comprehensive plan and your town” or “development plan and your town” or “comprehensive plan and your city, county” or province or country. Google “transportation plans and your town or county, or country” or “2050 and your town, county or city, etc.” or “visioning and your area” and you will find maps included in documents. Try googling “smart growth and your town” or your county, or your state, or your province or your country “. Try googling “sustainable cities 2025 and your area”. Or insert “2030”. Any of the terms that denote UN Agenda 21 can be used to search for maps. “maps and UN Agenda 21” or “maps and sustainable development” or “maps and Utility service areas” or “maps” and any of the following terms:”Urban Growth Boundaries, or wildlands project or Biospheres, or Global warming or transition town, or visioning or ICLEI, or Sustainable Development or Smart Growth or Form-Based Zoning or Green Energy Mandates or Carbon Offsets or Cap and Trade or Local Agenda 21 or Livable communities or UN Framework Convention on Climate Change or the Conventions on Biodiversity or UN Environment Programme or UN-HABITAT or American Planning Association, etc. Take a look at the any of the so-called “Green” groups that put together maps such as : Sierra Club, The Nature Conservancy, Greenbelt Alliance, 1000 friends of Oregon, 10000 friends of Pennsylvania, (I noticed there are several groups that call themselves “1000 or 10000 friends of”… google the “name of your area and friends of” and you might find one of these groups in your area too. You will find they have created documents with all kinds of maps in them. Google the”group name and maps” and you will be amazed at what pops up. Social Justice and Equity This is a very good website which exposes the con job of “social justice” which is NOT equal justice. The goal: redistribute people and cash. Bike Trails And some are even wheelchair accessible. How about that 2 feet of snow that just fell? It’ll be lots of fun riding your bike through that when you are 70. “most protective” “effective zoning” means being stricter than one dwelling unit per 20 acres which means: that you MUST have at least 20 acres before you can build your home or if you own 20 acres and you decided you wanted to sell off 10 acres to build some houses and make some money off YOUR land, you would not be allowed to do that, which essentially makes your land worthless. San Diego Regional Planning Commission geographic boundary viewer This is from San Diego. This map has several overlay features which allows you to “drill down” . Food Deserts If you live more than 1/2 mile from a grocery store you’re in a “food desert” so say the commies pushing UN Agenda 21.
http://www.tbs-sct.gc.ca/rpm-gbi/doc/dfrpmf-rbiffc/dfrp-rbif-mf-fc-eng.pdf Canadian info. There are a lot of links in this pdf. London, England Here’s a blog that discusses development which has a lot of maps and information related to what is happening in England. FYI The reason there is such a need for new housing ( high density, sardine can housing) is because England, as well as all other “Western” nations is being over-run with so-called “immigrants, legal or illegal. —> THE VIDEO below illustrates what is meant by “infill” which you will find in every development plan aka comprehensive plan and land use plan. Read —>THE ARTICLE which accompanies this video here. Here is the link where I found the above…there are tons of links listed.